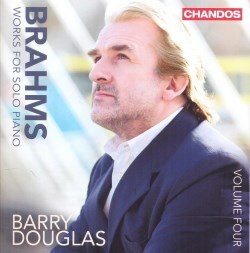 This is Volume Four of Barry Douglas’s survey of the solo piano music of Brahms. I have reviewed, and been impressed by, the previous releases (Volume 1 ~ Volume 2 ~ Volume 3). This volume was recorded in the same venue as the others though I notice that this time a different Steinway was used; this one is owned by Jesus College, Cambridge. In his excellent notes Nicholas Marston tells us that when Robert Schumann was making interest with the firm of Breitkopf & Härtel to get some of his young friend’s works published Brahms was insistent that he wanted his C major Sonata designated as his Opus 1. That was a bold statement for an up-and-coming composer to make but I think that the quality of the music justifies his confidence; this sonata is a fine way to announce oneself and with which to start a catalogue of published works. The first movement excitingly mixes heroism and lyricism and Barry Douglas is equally adept with both facets of Brahms’s inspiration. The variation form was to be an important element in Brahms’s compositional armoury over the years and the slow movement of this sonata offers the earliest published example. He takes an old German folk song as his theme for some gentle, ruminative variations. Barry Douglas does them beautifully. There’s drive in the way he plays the scherzo material in the third movement and then he gives an excellent account of the energetic and spirited finale. This is a fine reading of the sonata. As has been his wont throughout this series, Douglas gives us a selection of shorter pieces from the various collections that Brahms published over the years. Op. 117/3 comes from the other end of Brahms’s career so it’s a good choice to follow the early sonata. Its melancholy beauty offers a pleasing contrast to the youthful vigour of the sonata. Here Douglas displays a lovely touch. He’s similarly excellent in Op. 119/2 where his use of rubato is as pleasing as it seems natural. I enjoyed the other short pieces too, not least the fine liquidity of his playing in Op. 76/1 and the delicate, pointed staccato playing in Op. 76/2. Incidentally, Nicholas Marston points out the similarity between that piece and Variation V of the Schumann Variations. As Chandos have very helpfully put each of the variations in this work and in the Paganini Variations on separate tracks I was able to flick between the respective tracks (track 25 and track 12) and I can confirm that Mr Marston is spot-on. The Schumann Variations were based on a theme from Schumann’s Bunte Blätter, op 99. Brahms dedicated the work to Clara; was this the first piece he inscribed to her? The variations are compressed: the theme and 16 variations take just over sixteen minutes in this performance and quite a few of the variants play for less than a minute. But, to coin a phrase, length isn’t everything and these are resourceful and often subtle variations. Brahms is inspired by the theme but never fettered by it. Instead he uses Schumann’s theme as an imaginative springboard, for example in Variations V and XII. Barry Douglas offers a very fine performance. Among many ear-catching examples I would single out his expertly pointed delivery of Variation XIII and the beautifully poised renditions of Variations XIV and XV. Book I of the Paganini Variations also fares extremely well at his hands. Once again Brahms inspires admiration for his concision: here we have a theme, fourteen variations and a coda in the space of thirteen minutes; not a note is wasted. The theme is so well known nowadays – though perhaps rather less so in 1862 – and I like the point that Nicholas Marston makes in saying that here the theme functions “as an implicit harmonic scheme which it is the task of the variations to articulate and vary as they proceed.” Barry Douglas gives a terrific performance, bringing each variation, no matter how short, to life. Once more Brahms proves himself inventive in the matter of composing variations and there’s remarkable variety. I love the limpid delivery of Variation XII in this performance and also the capricious “tinkling” in Variation XIII. The tumultuous cascade of notes in the following variation impresses greatly but that’s no real surprise given the strength with which this pianist had already despatched the seventh and eighth variations. This is an altogether splendid performance and I hope that Book II will feature in the next volume in this series. As has been the case with previous issues in this Brahms cycle Chandos have produced a very fine recording which shows off the sound of the Steinway and the many facets of Barry Douglas’s pianism to excellent effect. The documentation is up to the usual high standards of the house. I’m enjoying following Barry Douglas’s traversal of Brahms’s piano music. This is another fine instalment and I look forward keenly to Volume 5.